You can see all your named objects by using the RENAME command. 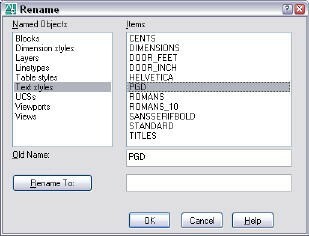 In the Rename dialog box, choose the type of named object you want, and you’ll see all of its items. Of course, you can also use this command to rename objects; it’s very handy for that purpose. Unfortunately, while you can select all of the named objects for a category, you can’t copy them to the Clipboard. I was looking for a way to jump from one text object to another for editing purposes. I was hoping to see a way of listing all the objects and then I could just pick the text objects from a list without having to set up views or navigate on the screen. Enter block name or [?]: ? Enter name of text style or [?] : ?